Those were the thoughts of CIA Director Irene Kennedy as she dealt with her new boss, a politician in charge of an intelligence agency. In Consent to Kill , some of the strife of Kennedy and her compatriot Mitch Rapp is caused once again by Washington Politicians. This latest Vince Flynn novel in the Mitch Rapp series started a little slow for me. Just as I was starting to feel a little disappointed, it took off. Unlike the other books in the series, hero Rapp was not called upon to save the world, the United States, or even the president. This thriller was personal for Mitch Rapp. Don’t expect a happy ending, but as usual there is a decisive and brutal finish. 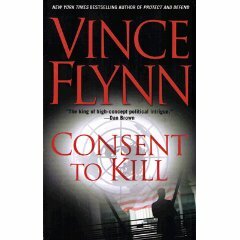 Consent to Kill is my least favorite of Flynn’s novels so far, but is certainly still worth reading. This article was published on Feb 21, 2010 . It is tagged chamberlain, cia, consent to kill, hitler, mitch rapp, my favorite, novel, politicians, power, soldiers, vince flynn. You can follow any responses to this article through the comment RSS feed.